The MTA board picks up where it left off last month — failing at to complete its basic fiduciary responsibilities. The MTA needs a lot of money to fix the subway system. More and more, Governor Cuomo and state legislators appear willing to let it starve. 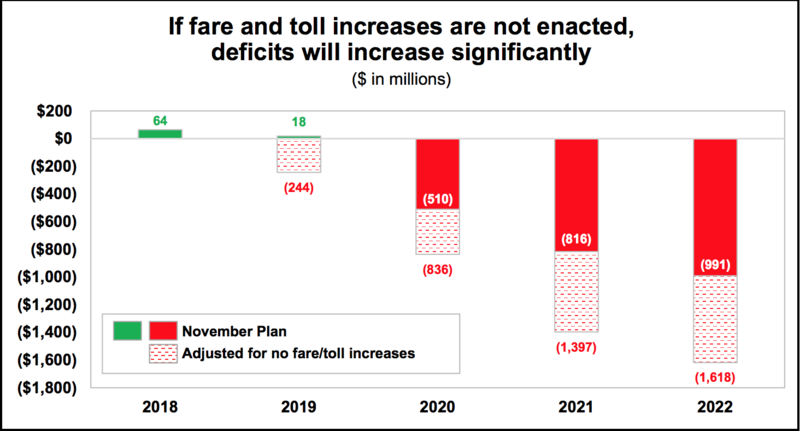 On Wednesday, the MTA board finally plans to vote on widely disliked but sorely needed increases in fares and tolls simply to avoid going into the red this year. But larger questions loom, including whether lawmakers have any interest in addressing the agency’s estimated $40 billion-plus capital needs. After a long delay — which cost the agency $30 million each month — the board will finally vote on fare and toll increases on Wednesday. Even with the hikes, the MTA’s projected budget shortfalls are big and getting bigger: $467 million in 2020 and nearly a billion by 2022. MTA Chief Financial Officer Rob Foran has repeatedly warned that the MTA would have to enact dire service cuts without an infusion of cash. In such dire straits, the MTA has instituted a hiring freeze. On Friday, Politico reported that agency bigwigs are preparing for layoffs — ironic given the bump in personnel and labor costs since Governor Cuomo’s 2017 “Subway Action Plan” emergency order. Cuomo has argued that legislators have a choice between congestion pricing and 30-percent fare and toll increases, but the truth is that the MTA’s financial needs far exceed the $15 billion congestion pricing would raise. Service and personnel cuts, therefore, are inevitable without more dedicated funding or, at minimum, the scheduled fare and toll hikes. It’s not clear what good simply gutting the place would do for riders. Governor Cuomo has spent much of this year bemoaning his professed lack of authority over the MTA — even as he exercises control through the hiring of its top management and the appointment of the biggest bloc of board members. The governor finally offered a vague plan in the 30-day budget amendments released on Feb. 15, proposing a six-person “expert panel” that would functionally supersede the MTA board by not only determining the congestion pricing fees, but also reviewing and approving the MTA’s capital and operating budgets. The proposal does not say who would appoint the panel. MTA watchdogs scratched their heads. “This is not the time to make major changes to redistribute power over the MTA’s governance structure, as there are too many stakeholders at risk,” Reinvent Albany senior analyst Rachael Fauss said in testimony to senators on Tuesday. Sadly, MTA board members, forced to oblige Cuomo’s opposition to fare and toll increases at the expense of the agency’s financial well-being, are powerless to fix things. Where are the mayor and county executives on this? By and large, they seem willing to hand over any leverage they have to the governor. Last week, Nassau County Executive Laura Curran conceded a months-long fight with the governor over her single vote on the board, nominating Cuomo’s preferred candidate, a 77-year-old real estate executive, instead of the hero cop widow Patti Ann MacDonald. That executive, David S. Mack, was vice chairman of the MTA from 1993 to 2009 — meaning he’s one of the many people responsible for the current mess. In 2008, after then-Attorney General Cuomo made free EZ-Pass given to MTA board members illegal, Mack mocked transit as an “inconvenience,” conceding to the New York Times that he only rode the train five to 10 times a year. That’s the type of MTA Cuomo is putting together, and de Blasio appears to be okay with it, tiptoeing around Cuomo’s congestion pricing push while neglecting to leverage city residents’ taxes, fares, and tolls — which already fund the vast majority of the MTA’s budget, according to analysis by the Citizens Budget Commission. You’d think the mayor would be more concerned about a congestion pricing plan that chips away at the city’s already limited home rule powers by giving the state carte blanche to park its tolling infrastructure wherever it wants without any review or oversight by the city. The prospects for congestion pricing are murky as ever and legislators aren’t eager to come up with alternatives. Speaking to Streetsblog earlier this month, Senator Joe Addabbo (D-Queens) attempted to clear himself of responsibility. “The Queens delegation met … and as a delegation, we all agreed, we need more details,” he said. Addabbo suggested that MTA officials lacked “initiative to think creatively” in addressing their funding troubles. The governor’s proposals do deserve scrutiny and the MTA should find ways to cut costs. Neither of those things excuse inaction. Enter Majority Leader Andrea Stewart-Cousins, newly unafraid to assert her power in the wake of the Amazon deal’s collapse, which Cuomo blames on her caucus. That blame runs so deep, apparently, that Cuomo has already given up on defending the Democratic Party’s clearest senator majority in nearly five decades. The governor may be overstating his own leverage. 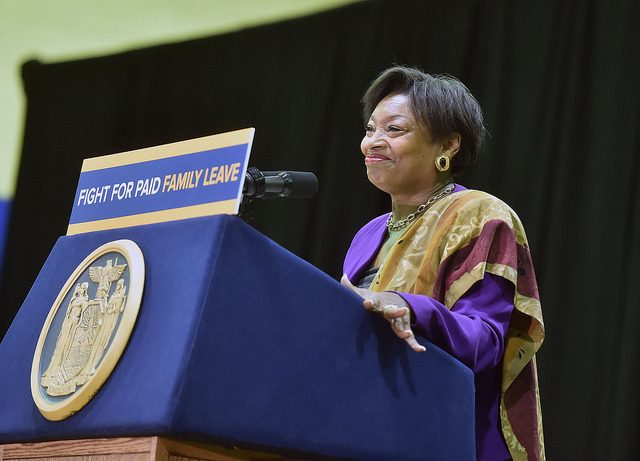 Stewart-Cousins holds the key to Cuomo’s other priorities, including his nominee for MTA chief executive. It’s not likely she give up her caucus’s newfound political power. MTA observers hope her practically unprecedented move to hold an MTA oversight hearing in New York City early in the session bodes well for the future. The growing distance with the governor offers legislators a chance to distinguish themselves. Last week, senators convened their first MTA oversight hearing in five years (the assembly has not be similarly eager). Cuomo’s decision to take the L-train shutdown out of New York City Transit President Andy Byford’s hands must have aggravated the 30-year transit professional, whom Cuomo hired a year ago with the broad mandate to fix the city’s transit system. Byford set out to do just that, even daring to give it a pricetag: $39 to $60 billion. That must have irked the governor, who wants the relatively paltry $15 billion congestion pricing will raise to avail him of further fiduciary responsibility. Speaking to business bigwigs earlier this month at a lunch hosted by A Better New York, Cuomo mocked Byford’s budget estimates. “That’s not a range. That’s a guess,” the governor said with a smirk. I have publicly stated that Fast Forward needs $40 billion over 10 years. This would be in addition to what we would normally expect for state of good repair (Fast Forward modernizes the infrastructure while state of good repair keeps what we currently have in good order). My pitch is we can totally modernize transit within just 10 years for a cost delta of $4 billion a year, a price that is very worth paying. In the same speech, Cuomo mocked the MTA’s unionized workforce and bemoaned the agency’s dysfunction as an example of “nobody” being in charge — despite his effective control of the agency. The governor’s apparent frustration with Byford’s funding requests is already impacting the outlook for his “Fast Forward” plans. In expectation of receiving just $30 billion, transit officials have cut back the number of stations they plan to make accessible from 50 to 36, the Daily News reported on Saturday. And yet, Byford keeps chugging along. When transit journalist Aaron Gordon of Signal Problems questioned whether NYCT would provide adequate service during L-train single-tracking, Byford issued a statement assuring riders he’s still in charge. “As the person accountable to New Yorkers for the safe and reliable operation of this revised plan, I will insist on whatever measures and whatever operational flexibility I need to achieve that objective,” he told Gordon. And this weekend, Byford shared good news: on-time performance is the highest its been in four years — and delays the lowest. Still, ridership continues to plummet — down 2.6-percent on the subways and 5.9-percent on the buses this year over last. Improvements will never come fast enough, but they’re coming. Whether Cuomo let’s Byford continue that progress remains an open question. Story was updated on Monday morning to include a new comment from Byford. A 77 year old guy who voted to run up a huge debt he won’t be around to pay. Great. Those are the very years when the future (now the present) was pillaged. The good news about having someone like that on the board is that there is someone to yell at, other than of course Ferrer. The rest of them are slinking away. Here’s the problem, and its across public service. Because so much of the total compensation is accounted for richer pension deals for earlier hired generations of workers, public agencies suffer from both sky high labor costs and pay that is too low to attract qualified and motivated employees, both at the same time. Virtually no one in public service, aside from football and basketball coaches, is overpaid IN CASH. Not in starting pay in particular. As for reversing the retroactive pension increases, and the exemption of public employee pension income from state and local income taxes, remember that vote on a constitutional convention that was basically hushed up, aside from the political/union class whisper campaign to show up and vote no? That’s what it was about. In January 2018, the MTA sent out 2671 email service alerts – unscheduled train delays. In January 2019 then sent out 3831. This discrepancy might be explained by a lower threshold for sending out an alert. However??? On-time performance is based on is based on the comparison of two parameters: the scheduled time for a train trip’s arrival and its actual arrival. If the MTA increased the scheduled trip time, the OTP would improve, without the passenger realizing any benefit. In January 2018, 7.5% of all trips had one or more scheduled dwell times of 5 minutes or more. This increased to 9.3% in January 2019. In January 2018 18.6% of all trips had scheduled dwell times whose total exceeded 5 minutes. This increased to 19.3% in January 2019. I dont see anything about lowering labor costs. It is time to remove the welfare position on every train, you know, the guy who sits in the middle and pushes a button to open doors. No other system in the world pays someone to do that. I do believe it, based on the anecdotal evidence. I bike more than half the time, but I haven’t had a significantly horrible subway commute in more than a year. Back in 2015 and 2016, when only Gothamist and Streetsblog was reporting on it, I was having horrible commutes every week — even when I only took the subway one day in a week. I believe that’s when things hit bottom. Since the entire signal system hasn’t been replaced in the past two years, this raises some pressing questions. Why was the situation so horrible three or four years ago, after having been so good five or six years before that? Who stopped doing what? One thought I’ve had is for NYC to buy out the pensions of all workers, both retired and active. For those retired, the retirees would be given a one-time cash payout of 5 times their annual pension. If they can get returns of 20%, they will be getting the same amount they’re getting now. If not, they’ll be getting less. For those not yet retired, there would be a cash payout based on years of service and the contractual pension amount, followed by an addition cash payout until retirement. This gets NYC and the MTA is off the hook for good as far as pension obligations even if it might be a big expense now. My thinking is the existing pension funds could cover most of this. Larry, for what it’s worth, some portion of private pensions are also exempt from state and local income taxes, as is the amount of Social Security benefits which is taxable on a federal level. A big part of the problem was that pension benefits are too generous. They shouldn’t include overtime in the calculation. Also, regardless of the number calculated by the formula, there should be a maximum cap on pensions. The idea of pensions is to keep retirees out of poverty, not to let them live a gold-plated retirement like teachers with $80K pensions are doing. The pension amount should be capped at maybe $2,500 a month maximum, which should then be adjusted for inflation annually. Between that and Social Security benefits, some retirees would be getting as much as $5,000 a month. If they can’t get by on that, they need to take a course in managing money. Once CBTC is installed system-wide, you don’t need the T/O, either. As generous as they are if that had just left them along end kept pre-funding them at 13-14 percent of payroll, we wouldn’t be in this mess. But you had the 2000 deal to cut funding, increase benefits for the long-retired, and cut employee contributions. Just remember, of the city pension plans NYCERS is the least in the hole. The hole is much bigger for police, fire, teachers. If you are dealing with labor unions, you are automatically paying above the market rate necessary to attract quality employees. Labor unions are effectively price fixing cartels. You have also hired too many people in service to union work rules. There is no doubt that there is substantial savings to be realized in reduced labor costs. But OK. If NYC can’t reduce its labor costs, then it just means NYC has to come up with that $60 billion on its own. Money is fungible, after all. Bob in Schenectady won’t be interested in shelling out his own money to pay for capital improvements in NYC when NYC has chosen to fund pension benefits instead of capital improvements. Bob likely doesn’t get a pension. A city doesn’t have market forces to constrain its spending. Politicians can be tempted to buy both labor peace and political support by offering generous contracts. Said politicians can’t be allowed to export that cost to Bob since Bob has no say in the contract. Politicians love getting money from people who can’t vote against them. It’s a reasonable idea but how would you get the labor unions to accept it? Correction: Once CBTC and platform-edge doors are installed systemwide, you don’t need the T/O. NYC could do the same thing corporations do to get out of labor contracts, namely declare bankruptcy. At that point the labor unions have to accept whatever the city offers them. In addition to the buyout, I would also reform work rules to end the overstaffing, end night/weekend differential, reduce vacations, etc. The idea here is that you will no longer get people making careers out of low skilled or medium skilled jobs just because of the benefits and pensions. You might get people fresh out of college or high school who will work for the MTA for a few years, then move on. You only need good benefits and pay for the skilled positions where you do want to retain people long-term. The governor is literally all over the subway map. What the Hell is Cuomo Doing to the MTA? MTA-TWU Agreement: What’s the Plan Now, Governor?